The Edwards had a lot of build up on the rim. As I cleaned it I realized that all of it wasn’t build up but a fair amount of charring and a larger fill on the back of the rim of the bowl. There was also the largest full I’ve ever seen on the bottom of the shank. 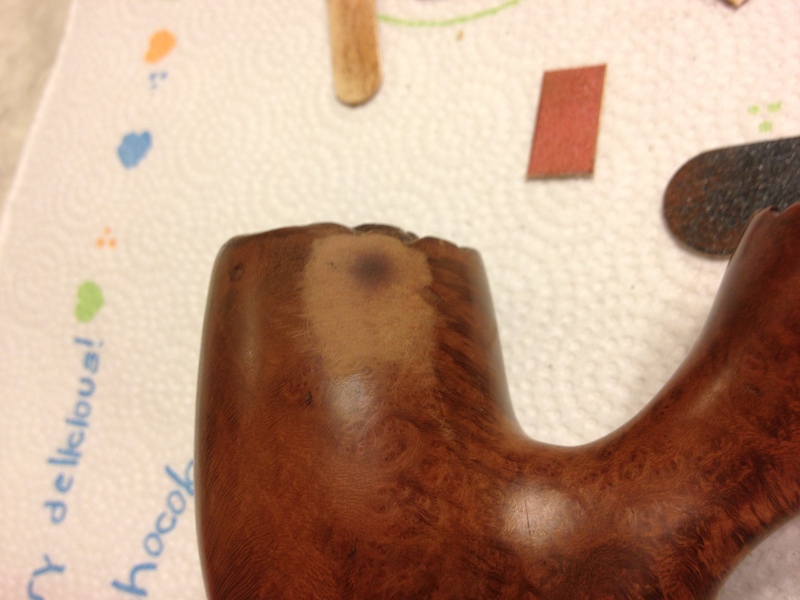 I decided that I wouldn’t try to remove and refill these areas but just refinish the pipe with them as they were. 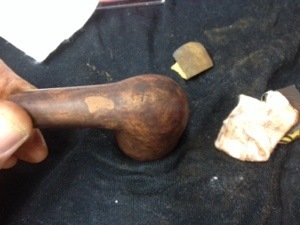 Although very large, they wouldn’t effect my personal enjoyment of this pipe so I didn’t feel there was any good reason to cool with them, and I had some concern that fills that large, disturbed, might present problems down the road. I reamed back the thick cake to a nicer, even level, using all four bits on my Castleford reamer. I then put the bowls into an alcohol bath and the stems into an OxyClean bath and left them overnight to soak. The next day I starts with the stems, taking them out of the bath and washing them under warm water with dish soap. I was surprised at how easily the oxidation came off after this with a miracle eraser scrub; I’ve used miracle erasers many times, but not on all stems, and have never had such good results. I wish I knew what the variable was to give me this result this time but I don’t. Next I scrubbed the stems out with alcohol and pipe cleaners until they came out white. At this point took the bowls out of there bath and wiped them down. 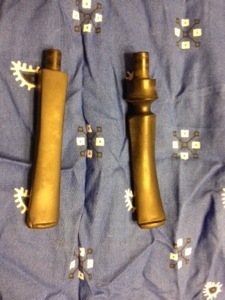 In the photos you can probably see (above) that the stem/shank union was not flush at all. 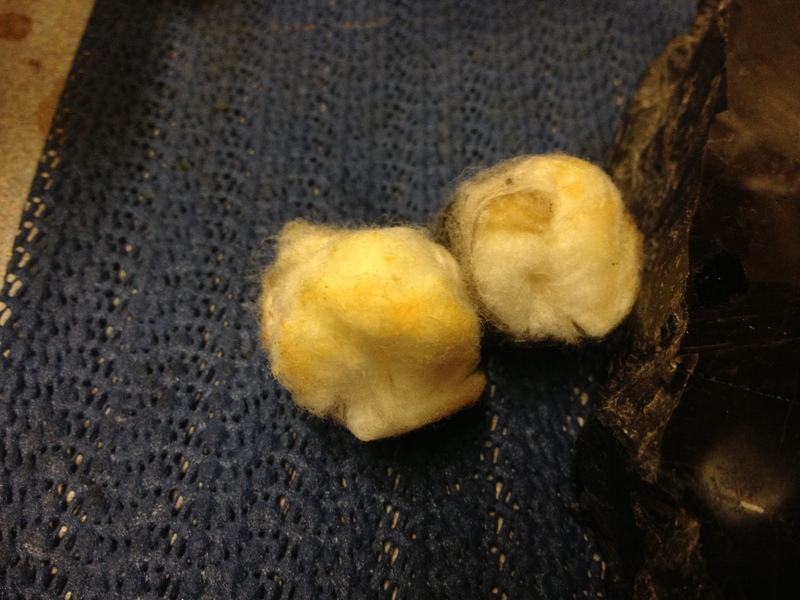 I figured the problem was a buildup of tar and gunk in the shank so I set the bowls at an angle, shank tilted up, and placed cotton balls in the bowls. I filled them with alcohol with a syringe and then also filled the shanks the same way, plugging them with cotton swabs. I let them soak while I worked on the stems, changing the cotton swabs out as they drew out tars; I changed them three times I think, going to doubled over pipe cleaners the final time. I polished the stems with plastic polish, making sure they were literally squeaky-clean before using micro mesh pads 1500-4000 grits, wet, to bring up a shine. The condition was very nice, to my eye, at this point, and the bowl needed a lot more attention so I set the stems aside to get to the bowl. 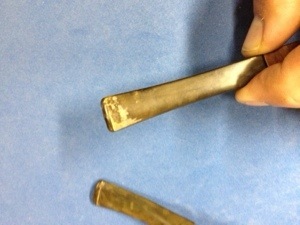 The shanks were very thick with build up even after the soaking. I used the Senior Reamer drill bit on the GBD but it was too large for the Edwards; I chose I smaller bit for it, the size of which escapes me. 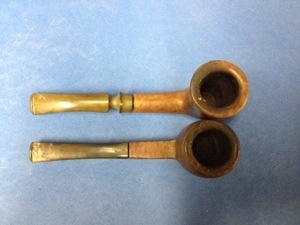 After many bristled and smooth pipe cleaners the shanks were finally gunk free and the stems seated well once again. I sanded the bowl rim to reduce the damage of the charring as much as I could while trying to not alter the shape. This was a challenge and I left a little more char, which I tried to blend later with dye, than I’d normally like but I really wanted to keep as much briar as I could for the shape and for insulation since the walls aren’t very thick to start with. I also lightly sanded the rest of the stummel, while avoiding the already faint nomenclature, to remove the last of the finish and some scratches with 320/400 grit wet/dry paper. To start, I put a little stain on the rim of the bowl using some furniture touch up markers I found at our local Walmart: three markers for $4 I think. I wanted to get a base coat started before I went forward. 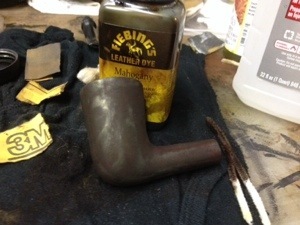 Next I applied a coat of mahogany leather dye to the entire pipe; it is dark but not as red as some of the other color choices Fiebings makes and I thought it might help hide some of the defects and being up the contrast at the same time. 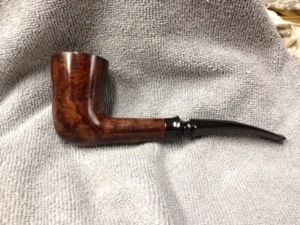 I didn’t flame this in, by the way, since I didn’t want to change the entire color of the pipe. After it had set for about 10 minutes I sanded it back off with 400 grit paper to where I liked it. At this point I was pretty happy with the overall results: most of the defects were fixed or hidden, except for the two biggest fills, which didn’t hide as well as I’d liked but about as I expected. Off to the buffer the pipe went now: the entire pipe, stem and all, got a buffing with tripoli, white diamond, and carnauba wax, flowed with the clean, soft buff and a hand final buff. The final result is one I’m pleased with: a nice looking and good smoking old pipe. 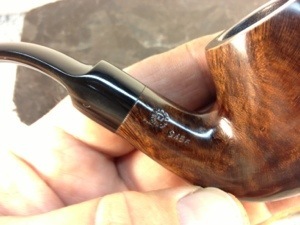 This entry was posted in Examples of Refurbished Pipes, Pipe Refurbishing Essays and tagged algerian, briar, Edwards Dublin Pipes, Edwards Pipes, Greg Wolford on October 14, 2013 by Greg. I have looked at Greg’s leather work for quite a while now. If you follow the links from the bottom of his posts here on the blog you will see some of the work that he does. He also has an Etsy Store where he sells his leather goods http://www.etsy.com/shop/WolfysLeather?ref=search_shop_redirect . 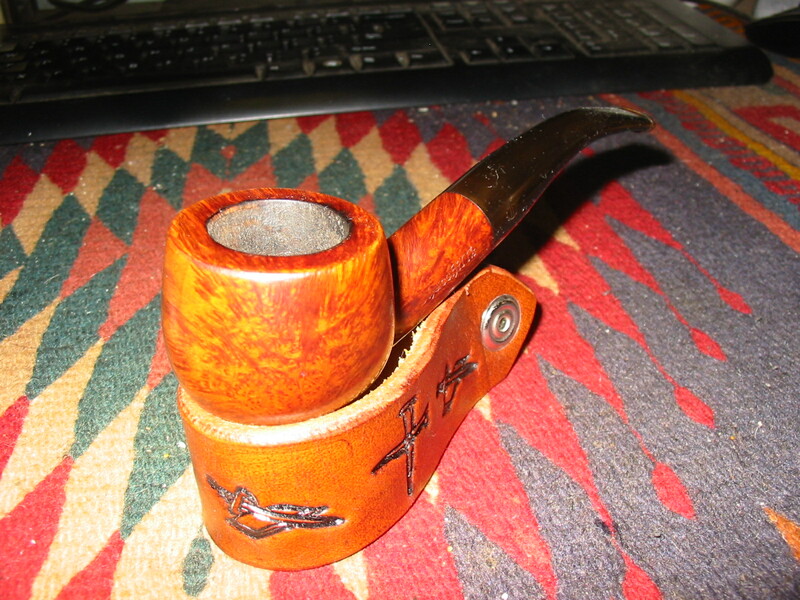 He always has a great assortment of pipe stands and pipe holsters that he fashions from leather that he shapes, stamps and stains. He also does custom leather work to order and has a website that has contact information http://my.sociopal.com/wolfysleathe . 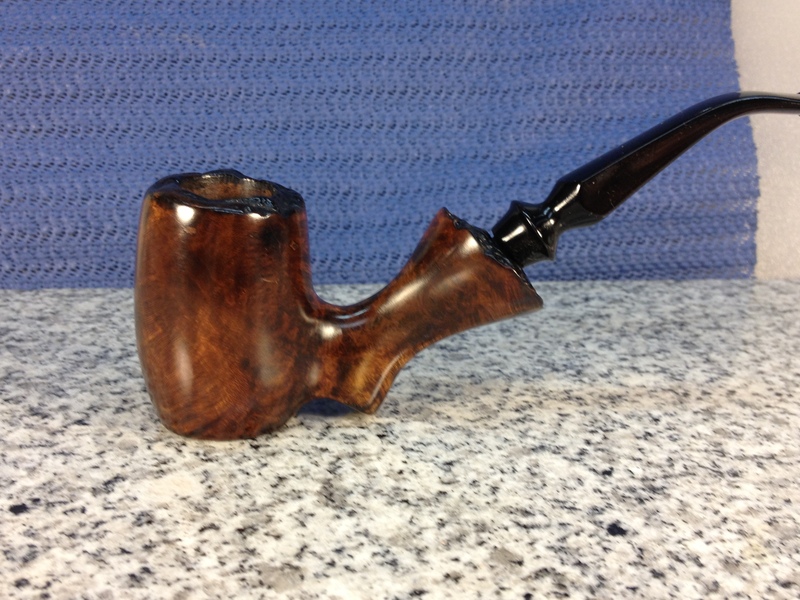 This week I was gifted a pipe stand by Greg. It is a generous piece of leather that Greg stamped with a cross made of nails and a Bible with a sword across it. 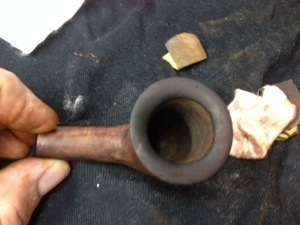 It is stained a rich dark brown colour with silver/nickel snaps on the ends. 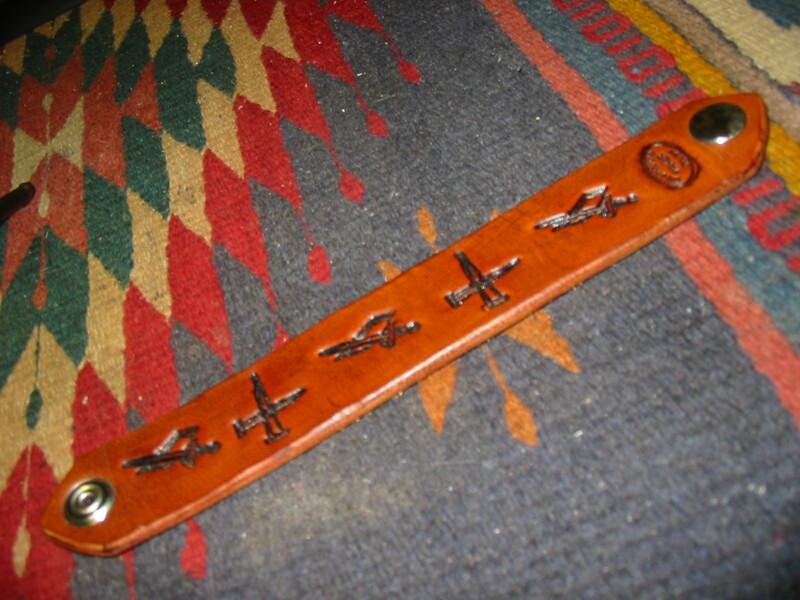 The edges are beveled and the antiquing in the stamps and on the edges give the leather a rich aged look. 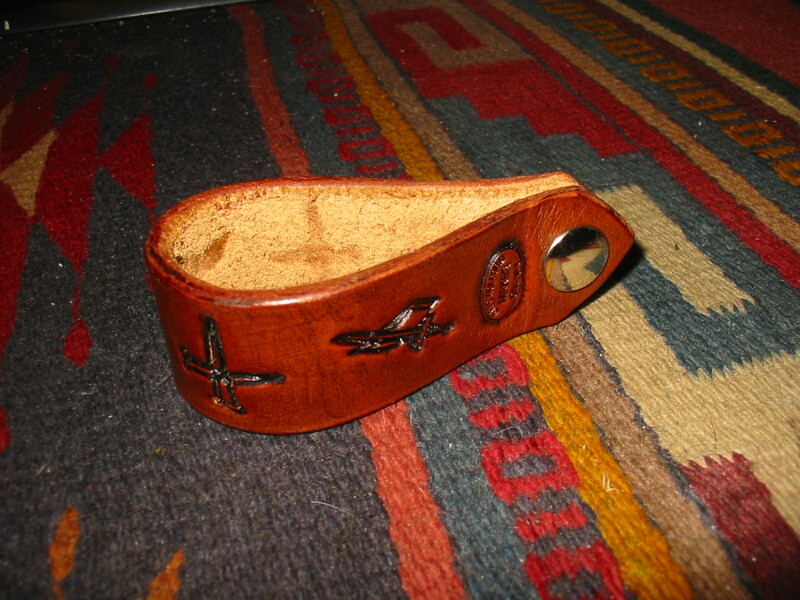 When the snap is connected the leather forms a tear drop shaped pipe stand. 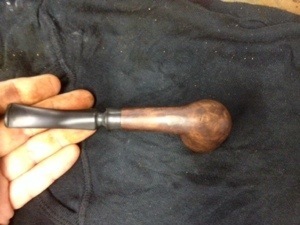 It fits easily in a pipe bag or a coat pocket and is readily accessible for a pipe stand on the go. Greg did a great job on it. The size of the stand is pretty much one size fits all as a variety of pipes of different sizes and shapes fit the stand with room to spare. The stand is snapped into place in the photo below. 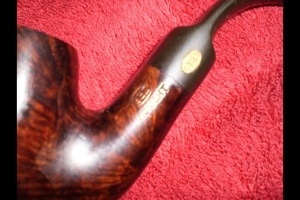 In the last photos below I have my Churchill’s pipe resting in the stand. It is a wide bottomed pot shaped bowl and it fits easily in the rest. 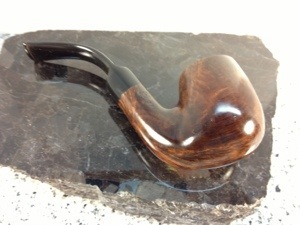 It is one I plan on keeping in my pipe bag for my travels as it is easy to pack, takes up little room and quickly provides a resting spot for my pipe. “I recommend that you wax it every few months, 2-6, depending on how you use it, with Kiwi shoe polish. This will help it to stay water resistant by protecting the top coat over the dye and the antiquing in the stamping. You can use neutral or brown if you want to add to/enhance the color. I have made a short YouTube video on the how, why and what to use for this process which can be viewed in the YouTube video below. Thank you Greg for the great pipe stand. 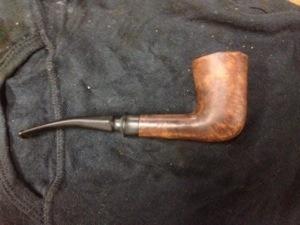 I am enjoying using it as a part of my pipe smoking routine. It sits on my desk where it is accessible when I am at home and goes in the pipe bag when I am traveling. It is a perfect accessory for me. 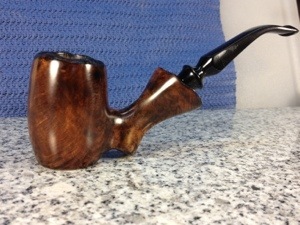 I would encourage any interested pipemen to contact Greg about getting a custom made pipe stand from him. You will not regret your decision. 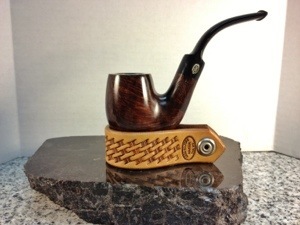 This entry was posted in Pipe Related Essays and tagged Greg Wolford, Leather pipe stands, Leather pipes stands by Greg Wolford, Pipe accessories, pipe stands, portable pipe stands, Wolfys Leather Pipe stands on September 18, 2013 by rebornpipes. 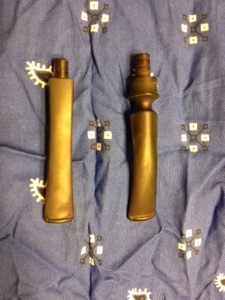 As I undertook this project I had no idea that Steve was writing and posting an article on tightening a loose stem. But when I saw it I figured that since this was a little different fix, and the pipe was already blogged about here, I would go ahead with the article. If you have read the story of Big-Ben then you know I had to restem it. It was the first time I’d done this and the first use of my new tenon turning tool, too. 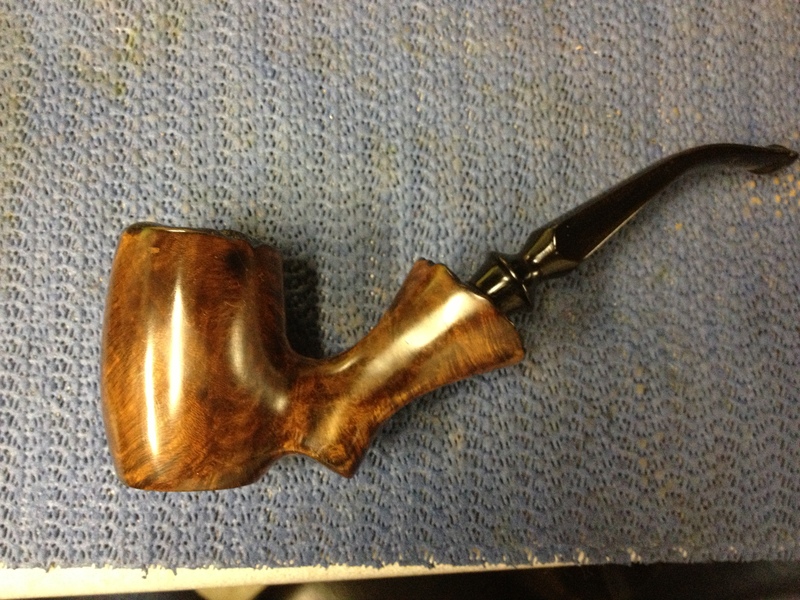 So, in my haste and excitement I made a goof, one that Ric Farrah was kind enough to comment on: I had not cleaned the shank out real well before fitting the stem, leading to a loose new stem. 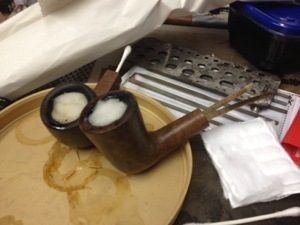 I tried beeswax and “smoking it in” but neither of these worked on this particular problem; as Steve noted often an application of beeswax and use will tighten up an estate pipe stem. But I suppose since this was just a goof on my part and the stem had not been for properly these solutions weren’t going to work. 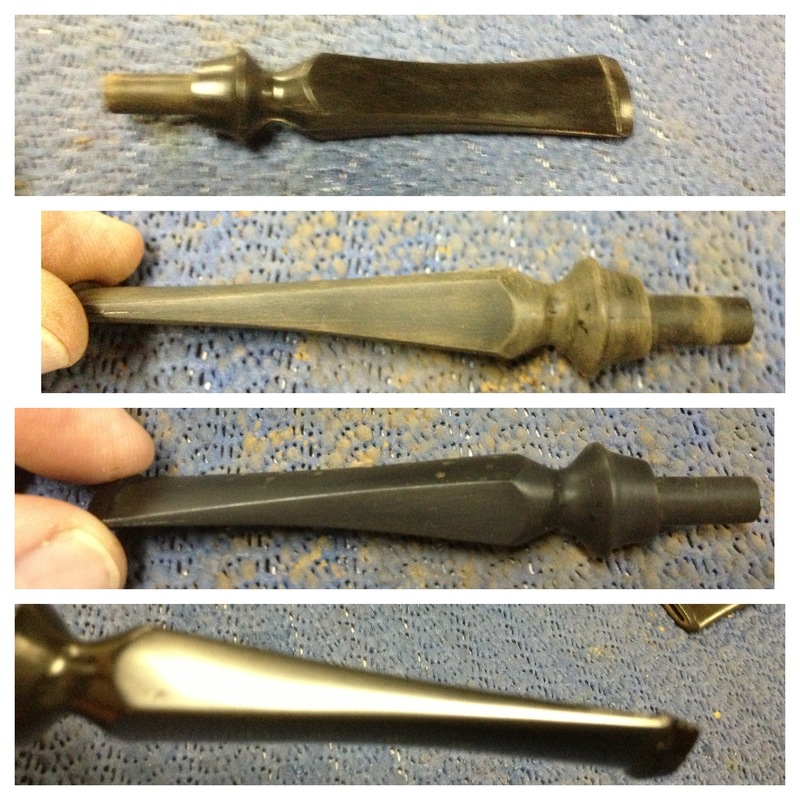 I was aware of the tools sold for stretching a tenon, the pluses and minuses that Steve mentioned. But I wasn’t really inclined to buy one at this point, especially since I had another idea on what might work: a drill bit! So, since the two easy fixes failed I went down to the shop to try out this new-to-me idea. I removed the stem from the pipe and checked the size of the air-hole against my set of drill bits. I thought I had drilled it out to 5/32 so this is where I started. 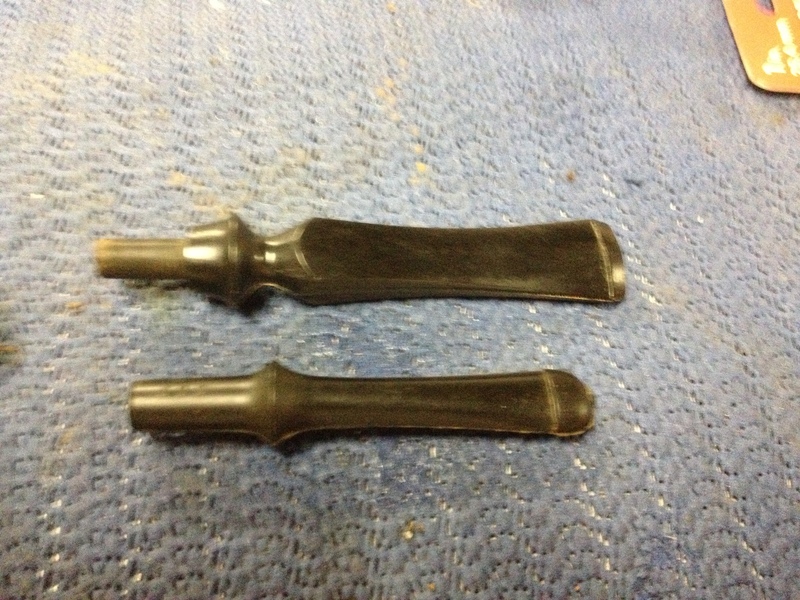 However, I soon realized that I had drilled it at 9/64 so I took both of these sizes and the stem to the heat gun set up. I almost always use leather gloves when I use my heat gun; things can get real hot, real quick. And since I was using steel drill bits I definitely wanted the hand protection. So, I donned the gloves and turned the heat gun on low to start stretching! Now, the first thing I need to say here is when doing this you are inserting the blunt end of the bit that normally gets chucked into the tenon. The sharp end is the turning end, in your hand for this procedure. This part is very important. 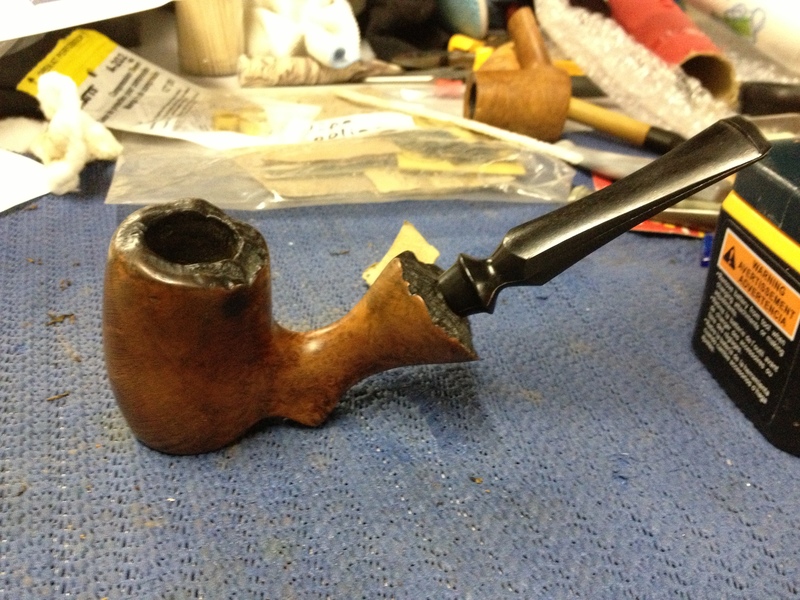 I began to heat the tenon slowly, checking every several seconds on the progress; I only wanted it warmed enough to be slightly softened, not so soft that it could easily be deformed or badly bent. 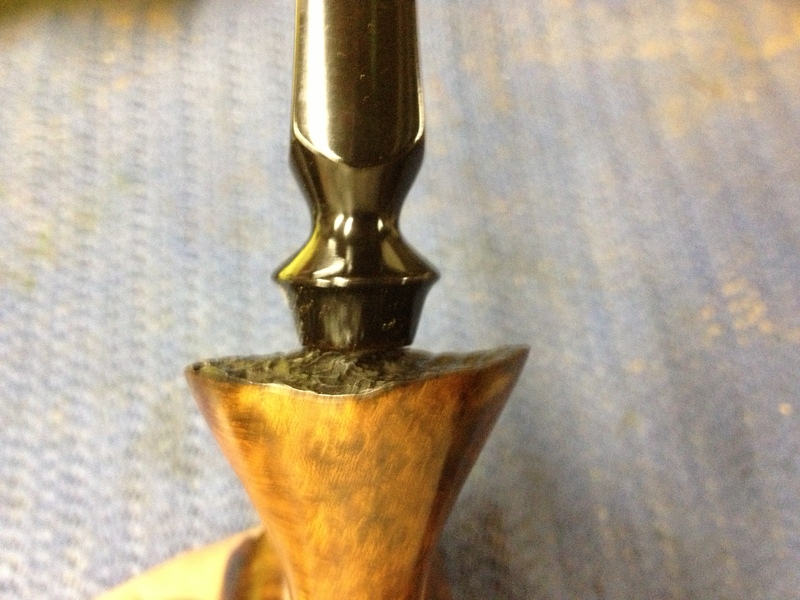 Keeping the tenon moving, I would take the smaller bit and try to insert it in the air hole until it went in. At this point I worked very gently to get the bit inside the tenon the entire length of the tenon, removing the bit/tenon from the heat. I kept the bit turning slightly while it was inside the hole so it wouldn’t stick. After about a minute I gently removed the bit and allowed the tenon to cool a few minutes before checking the fit, which ended up being too loose still. So, I picked up the larger bit and began the whole process over, this time resulting in a perfect fit: good and snug with no “play” or slipping but not too tight either. Finally, the new stem was fit properly! I left of overnight and loaded it up the next morning, checking the for again; it was still perfect, like it had been made for it (a little humor there)! 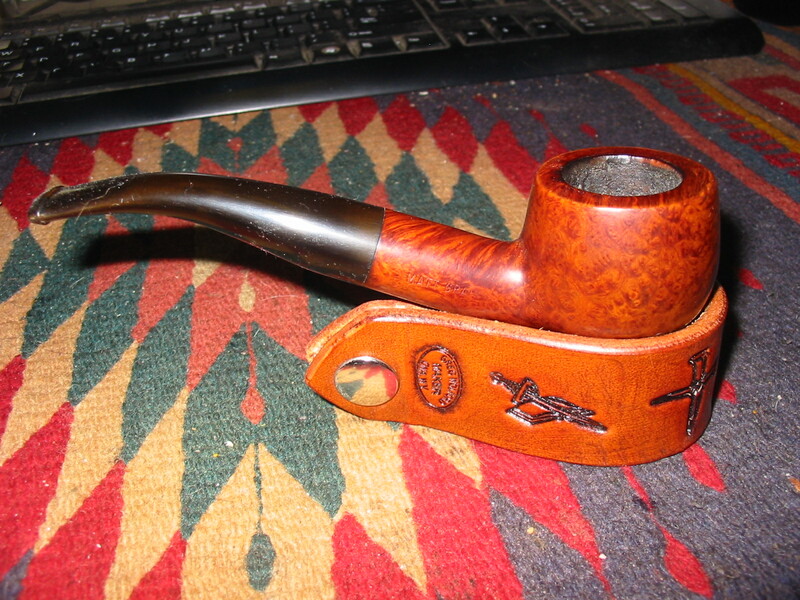 The pipe smoked good before the adjustment but it now smokes very well with a good fit on the stem, part of which I’m sure is in my head, not fussing or worrying about the bowl falling off. I found this fix very simple and expect to use it again in the future: it was done with tools/items I had on hand and only required a bit of patience and slow going to do right. Of course if I’d applied that idea to turning the tenon to start with I wouldn’t have had to refit the the stem. But then I’d not have had the opportunity to try out this fix if I had done it right to start with either: I suppose that is the silver lining in this cloud of errors! 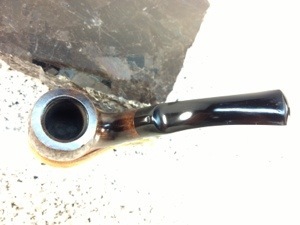 This entry was posted in Examples of Refurbished Pipes, Pipe Refurbishing Essays and tagged fitting a stem, Greg Wolford, Loose stem, pipe restemming, polishing stems, restemming, restemming a pipe, sanding a stem, shaping a stem, stem work, tighten stem, Tightening a loose stem on August 22, 2013 by Greg. 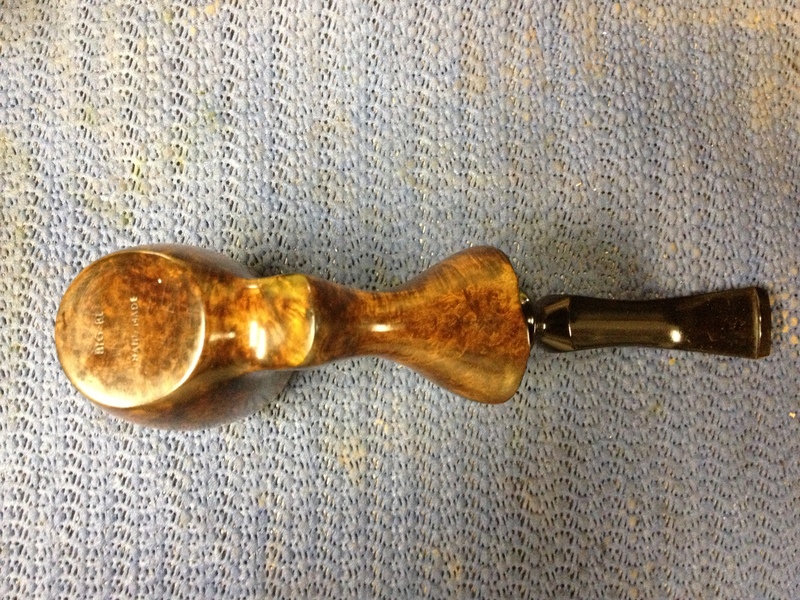 This stummel was gifted to me by a friend from Louisiana. We met via one of the pipe smokers forums probably near a year ago and he recently sent me two stemless pipes, this one and one I have yet to get to, to restore. These are interesting pieces, in my opinion, because of their history, a little of which I will share with you before I get into the “meat and potatoes” of the work. 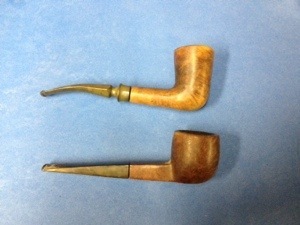 RJ, my friend, inherited a large quantity of pipes, near 100 if memory serves me. 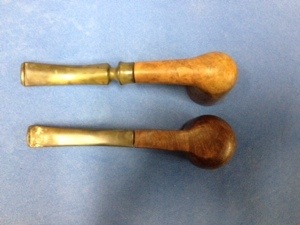 They were given to him by an aunt, I think it was, after her father passed away. Her father was Major in the US Army and served overseas in World War 2 (again, some of these details may be a tad off but they are close enough for our purposes). 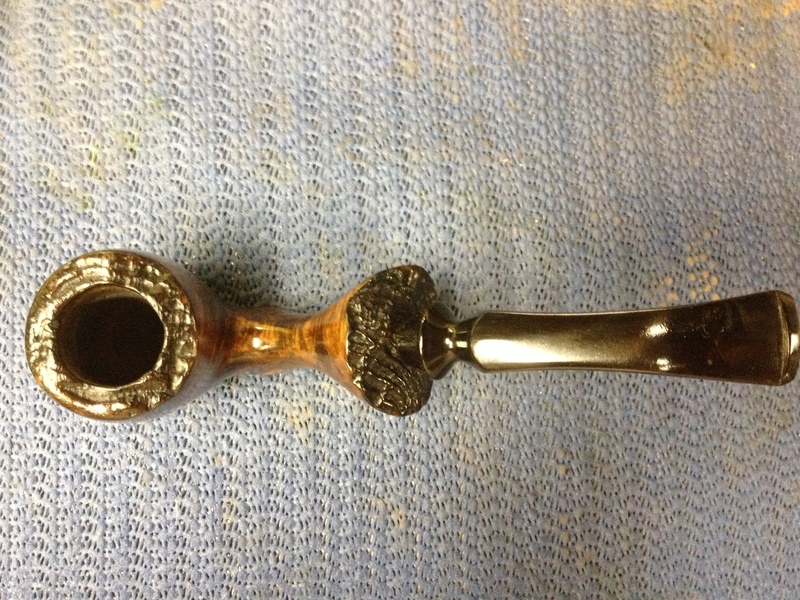 He was an avid pipe smoker and acquired many of his pipes while deployed overseas. The Major’s wife was involved in a serious car accident many years ago. Her injuries were serious, leaving her with diminished mental, and to a lesser extent, physical capabilities. THe Major, as they affectionately called the man, took care of her himself after this accident. Sadly, the Major began to develop Alzheimer’s with dementia in his latter years, though he continued to care for his beloved wife; they were separated from their daughter, who gave the pipes to RJ, by miles, geographically. The Major called his daughter the day after Valentine’s Day, 2005, and told her, quite confusedly, that her mother had gone missing. After much questioning, she called the police, local to her parents, and they dispatched a unit to the couple’s home. Shortening the story some, the Major had, in a state of mental confusion brought on by his disease, killed his wife. He was never found competent to stand trial for the killing of his wife 50-years. As far as I understand it, he was in a mental hospital for the rest of his life. A tragic story to be sure but an interesting one to go along with these unique pipes! 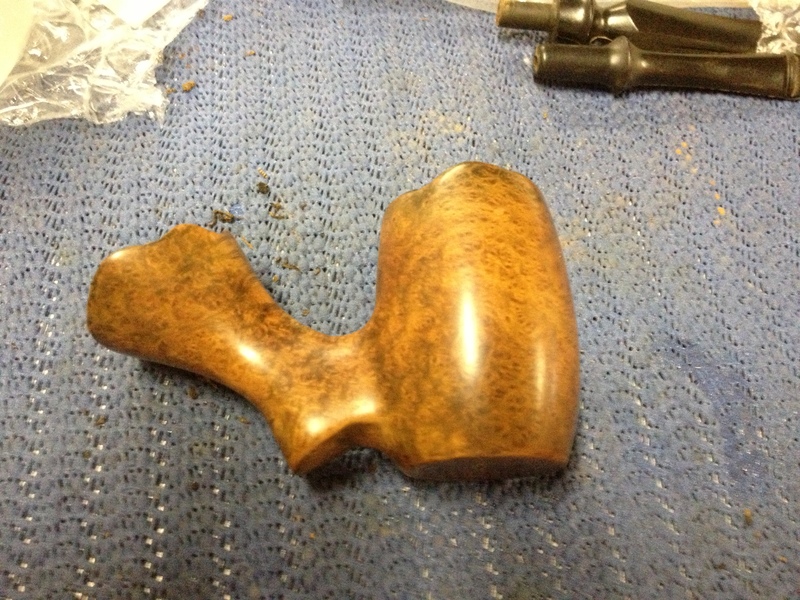 When the stummel arrived it was dull and dirty and, as I said, without a stem. 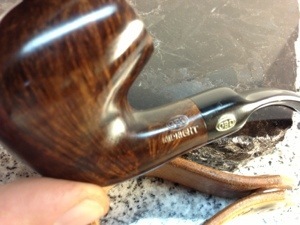 The bottom of the pipe is stamped “Big-Ben” over “Handmade” and the stamping is pretty good overall. Doing a quick search on http://pipephil.eu, it seems that the Big-Ben brand is a brand of the Elbert Gubbels & Sons -Royal Dutch Pipe Factory. Here are a few photos of it before I began any work. 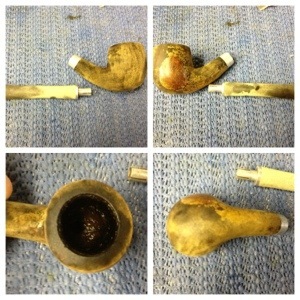 I actually began this restoration with the stem, finding the pipe a new one that is. 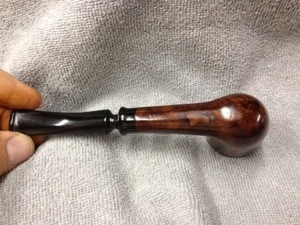 I had planned on using an acrylic stem but changed my mind for a couple of reasons: I was turning my first tenon with my brand new Pipe Makers Emporium tenon turner and know that acrylic is more finicky than vulcanite and I thought, after looking at it, that the rubber stem would look better on this stummel. The PME tenon tool is, by all accounts, essentially the same tool as the one offered by PIMO. I chose the PME tool because it was about $10 cheaper and they happened to have a couple of acrylic stems I liked on clearance for cheap. I plan on writing about my thoughts on the tool in a separate article. 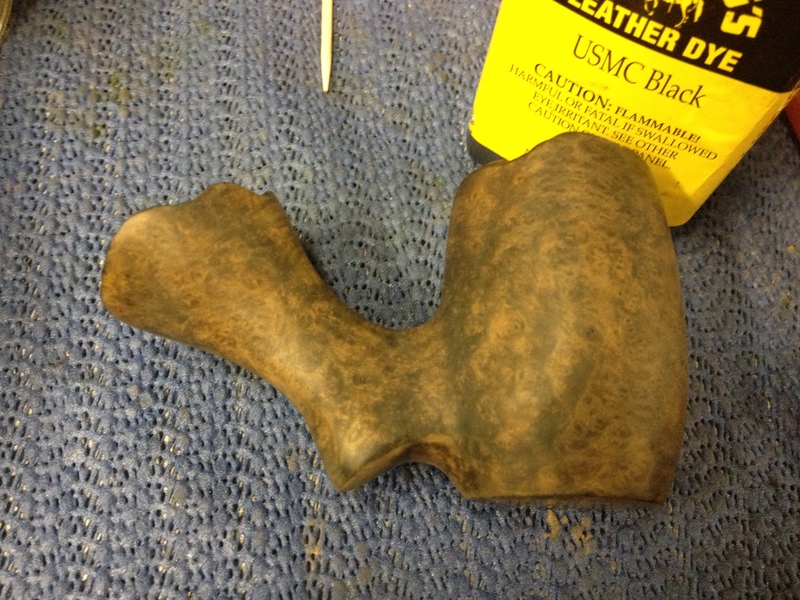 I sanded out the marks with 220 then 320 grit paper. The stem had some, but not many, small sots on it that made me decide to go head and use the 320 wet/dry paper on the entire stem. I progressed to 400 grit wet/dry and then micro mesh 1800 through 12000 (I also used the plastic polish several times between grits to make sure I wasn’t missing any scratches). Here is a progressive photo along the way from rough through 12000 grit micro mesh. The stem didn’t fit flush at the top and bottom due to the angle of the shank so I had to do a considerable amount of file work to get it almost completely flush to the shank on the top and bottom. 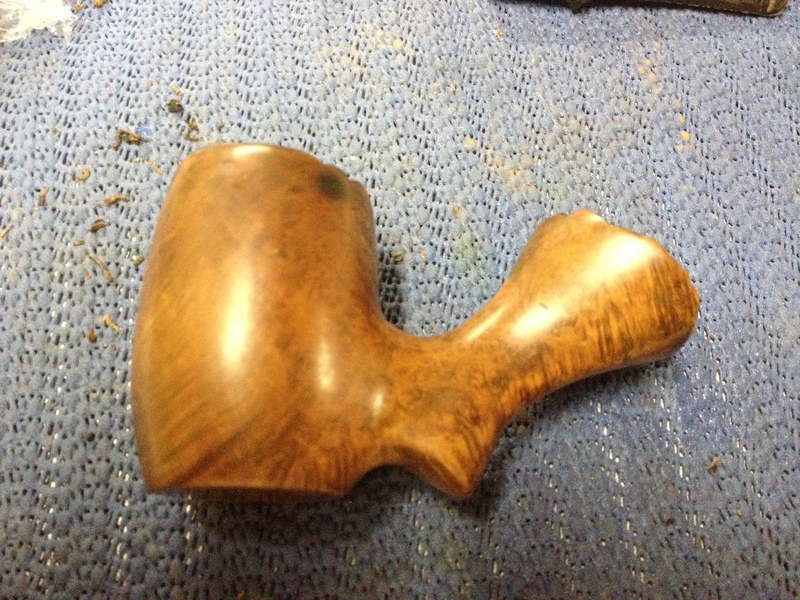 At this point I stopped working on the stem and turned my attention to the stummel. I wiped the pipe down with an alcohol soaked cotton pad. 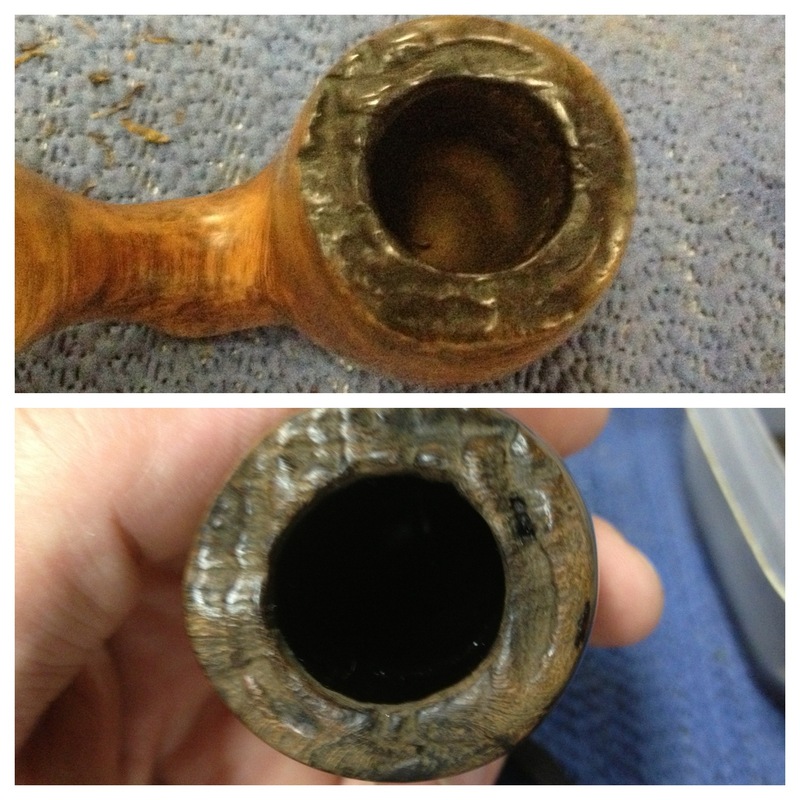 There was little wax left on the pipe and the wipe down removed what remained as well as some surface dirt. 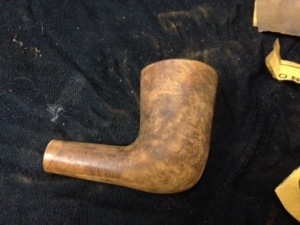 While the pipe was wet with the alcohol I could see there was a nice grain hiding under there, one that I hoped to bring out with a contrast stain. But first it would need an alcohol bath. So, I soaked the stummel a couple of in an alcohol bath. When I removed it I realized that the rim had a lot of build up on it; the rim, I thought, was stained black but that was just dirt, grime, and tar, and it was actually not stained black. 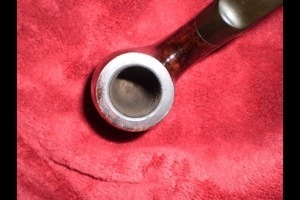 I then scrubbed the rim with a brass bristle brush lightly to loosen the grime, with not a lot of success so I put the pipe back in the alcohol bath and left it overnight. The next afternoon I removed it from the bath and wiped it down then took it over another container of alcohol that I use for cleaning and dipped in my wire brush and started to scrub gently again. This time I saw much more removal of grime; the extra time in the alcohol has paid off in really softening the buildup. I switched to a toothbrush and scrubbed out all the remaining grime. I found that there were some rim char under there that the gunk had hidden. Below is a photo of before and after the 12-plus hour soak and scrubbing. The photos don’t really show how much tar leached out into them; they were really quite brown. The shank was much cleaner now as I went back to it, only taking less than a dozen pipe cleaners to get it clean now. Back to the burn on the bowl, I started out with some course emery boards to remove some of the charred area. I had three different grits, from a package I bought at the local dollar store, and I worked through all three grits on it. The burn mark was reduced in size a fair amount but would need more, which I planned on doing with sandpaper. I thought the emery boards would be a good way to keep the more coarse sanding confined to a smaller area and it seemed to work fairly well. I saw one small scratch I had missed so I took the 400 grit paper to it and got that one out, along with lightening the burn mark a bit more. Now it was time to bend the stem. Now I applied a brown stain that I had mixed up earlier for another project; to be honest, I don’t recall what color I used or what I diluted it to. I applied the stain, flamed and repeated. After buffing it off with the old t-shirt I realized it was too dark for what I had wanted so I took an alcohol pad to it and removed some stain. But it was still too dark so back to the 400 grit I went. I sanded it over, wiped with an alcohol pad, and repeated until I was happy with the color; I think it took about four cycles to get it where I left it. I then buffed it off with the t-shirt one last time before heading to the buffer. 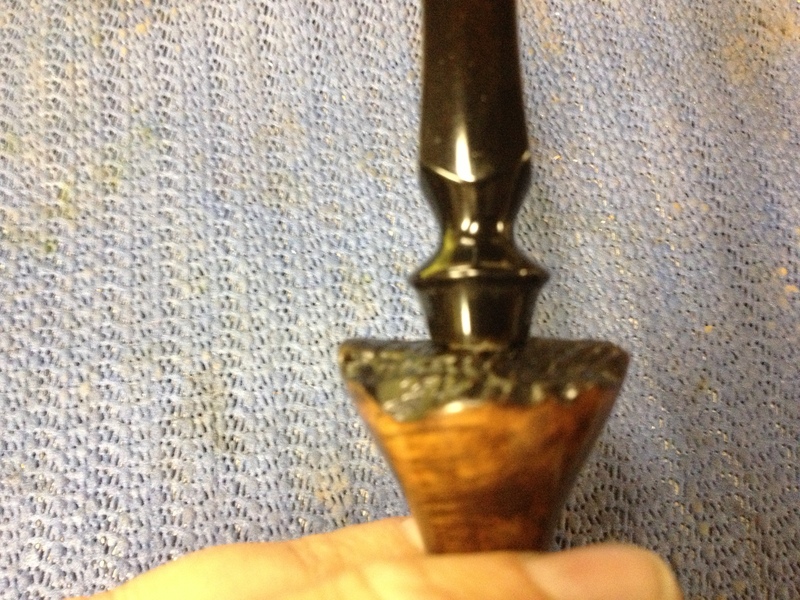 I buffed the stummel with Tripoli and then the stummel and stem, separately due to the way this pipe is made, with white diamond. Both parts then got several coats of carnauba wax, buffed on a clean soft wheel and finally hand buffed with my flannel gloves; I don’t know the flannel glove-buff is needed but it seems it adds a little “something” though it may only be in my head. But since it only takes a few extra minutes, and gets any stray threads of the pipe that the wheel may have left, I almost always finish this way. This entry was posted in Examples of Refurbished Pipes, Pipe Refurbishing Essays and tagged Alcohol bath, Bowl - finishing, Bowls - refinishing, buffing, contrast staining, ebonite stem, finishing, fitting a stem, Greg Wolford, micromesh sanding pads, pipe refurbishing, pipe restemming, polishing, polishing a stem, polishing stems, refinishing, refurbishing, restaining, restaining a bowl and rim, restemming, restemming a pipe, stem work, turning a tenon, vulcanite, waxing on July 24, 2013 by Greg. I picked up this Danish Sovereign off eBay for my son as a gift. I have one in a different shape and he has admired it since I got it. 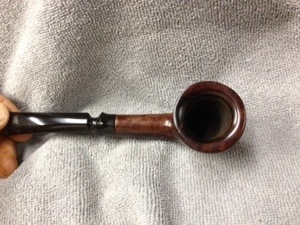 I knew that he had been wanting a Danish pipe and when I was this one it looked to be right up his style-alley. 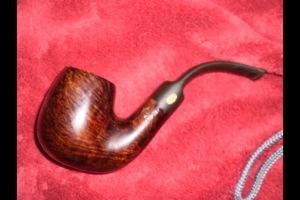 This pipe came described as in “mint condition” from an eBay seller. 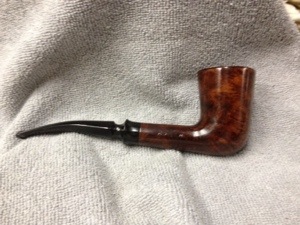 It was a Father’s Day gift for my son, his first Father’s Day pipe actually; he took up the pipe only about 8 months ago. The photos the seller provided were not good and none of the problems were shown/disclosed; I could see some oxidation but didn’t expect the chatter and dents. 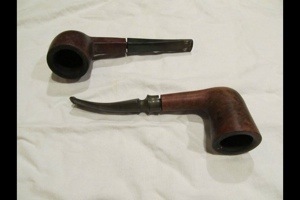 The seller shipped it not as expediently as I had hoped so the pipe didn’t arrive in time for Father’s Day; it came yesterday. 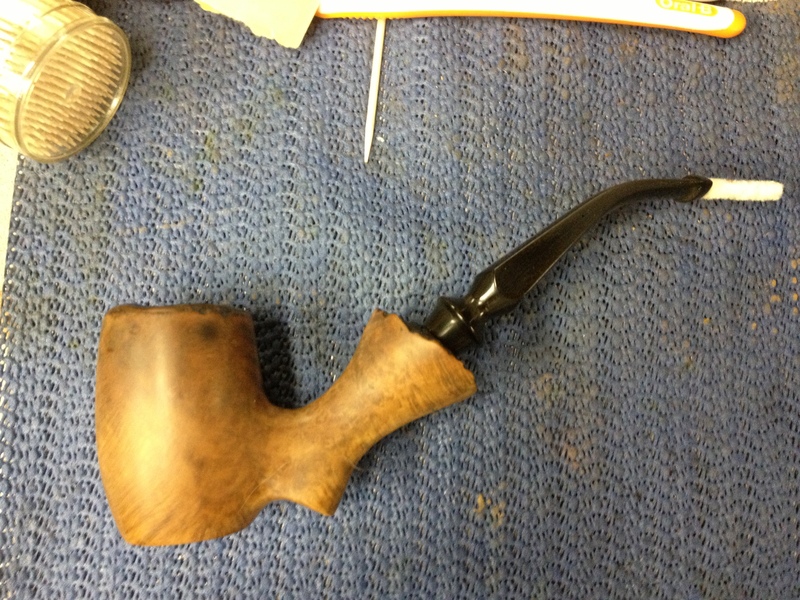 I spent the evening getting it cleaned up for him, not doing anything to alter the originality of the pipe, which is what he wanted. If he decides he wants me to, I may end up sanding it down and re-staining it, filling the dents as needed, to make it much more like new. But that’ll be his call since it’s his gift. I thought I would try something, actually a few things, different for this project: I used a few new things/processes, yes, but mainly the difference is I took video as I went instead of photos and will show the steps/progress in the video rather than writing it all out. This is something I have been wanting to try and so, now I have! Since it is the first time doing a resto-video I’m sure there will be things that could’ve been done better. And hopefully with time and practice, if this idea seems to “fly”, they will in the next projects. 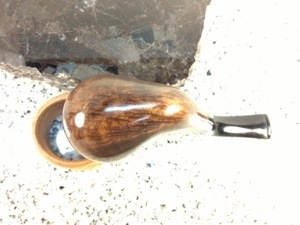 This entry was posted in Examples of Refurbished Pipes, Pipe Refurbishing Essays and tagged Bowl - finishing, Danish Sovereign pipes, Greg Wolford, Oxidation, pipe refurbishing, pipe restoration, refurbishing, removing bite marks, repairing bite marks, Stanwell seconds, Steaming dents in briar, stem work, video, vulcanite on June 20, 2013 by Greg. By chance, I found myself today with no obligations, no chores, no appointments, just a day to myself. Unfortunately it also stormed badly which flared up my arthritic joints but I was able, finally, to get to a project, if only a simple one. I picked up this GBD Midnight about two weeks ago. 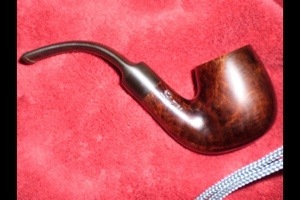 It was a fair price and an interesting pipe to me; all of the Midnight models I had seen before had acrylic stems and this one had vulcanite. Some later research led me to believe that there were at least two productions of this line: the first with vulcanite stems shortly after the merger and another some time later with acrylic stems. Although I forgot to take “before” photos the seller’s were quite accurate except for the oxidation was a bit more than I anticipated: it wasn’t thick or heavy but was even, all over brown. 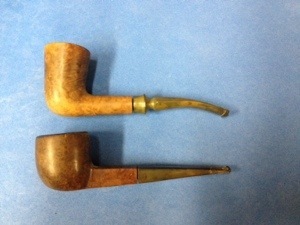 The seller said he had only smoked it a few times over the years and didn’t like it; he prefers a 9 mm filter pipe. He said there were a few tooth dents but not bad ones and that he had cleaned it; these things were accurate, if he meant cleaned the inside. 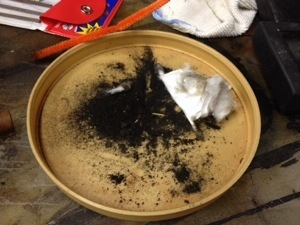 The too had a fair amount if tar build up but not thick. 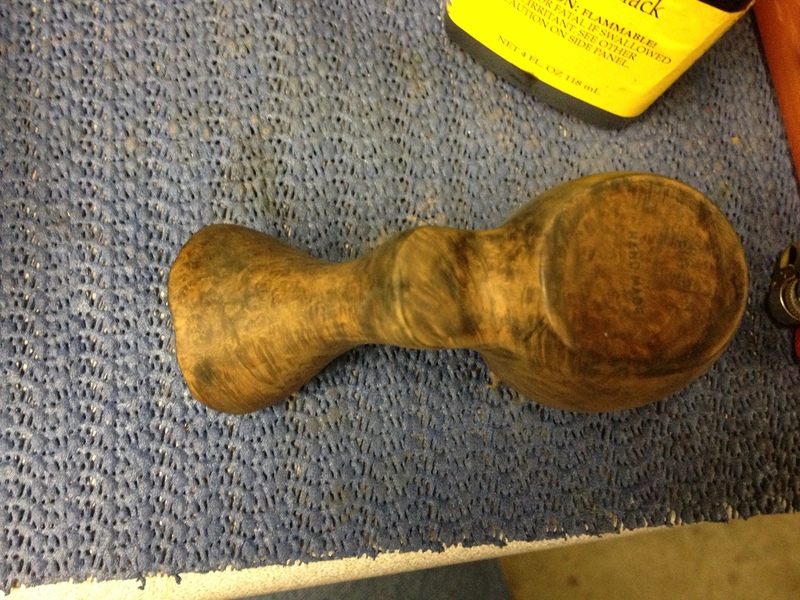 The stummel was dirty but not in bad shape at all. And the dents were mild as be had said. 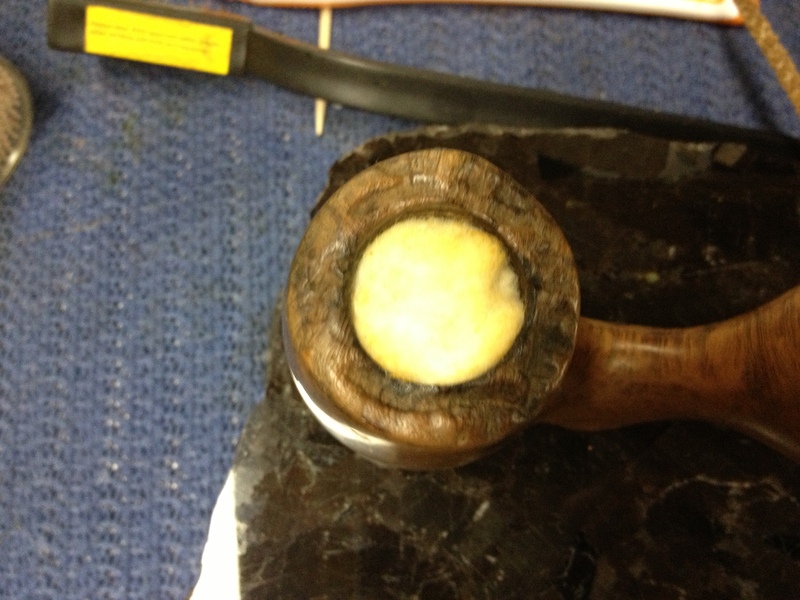 I began with an alcohol soaked pad, wiping down the stummel, paying extra attention to the rim’s build up. It didn’t take a lot to get it cleaned up and the rim smoothed out. I then reamed the bowl, which needed it but wasn’t badly caked. 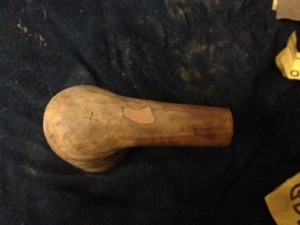 I set the stummel aside and began to work on the stem. 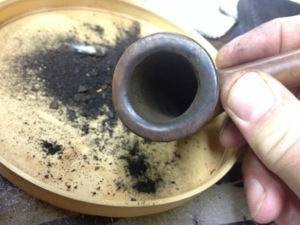 I started by rubbing the entire stem well with Back-to-Black, which removed a lot of oxidation. 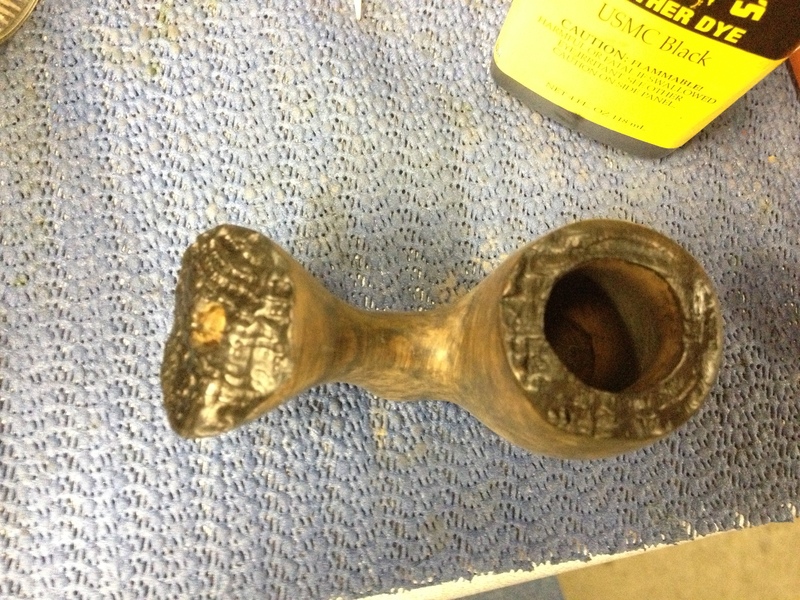 Then I took some automotive rubbing compound and cotton pads and polished away almost all of the remaining oxidation. 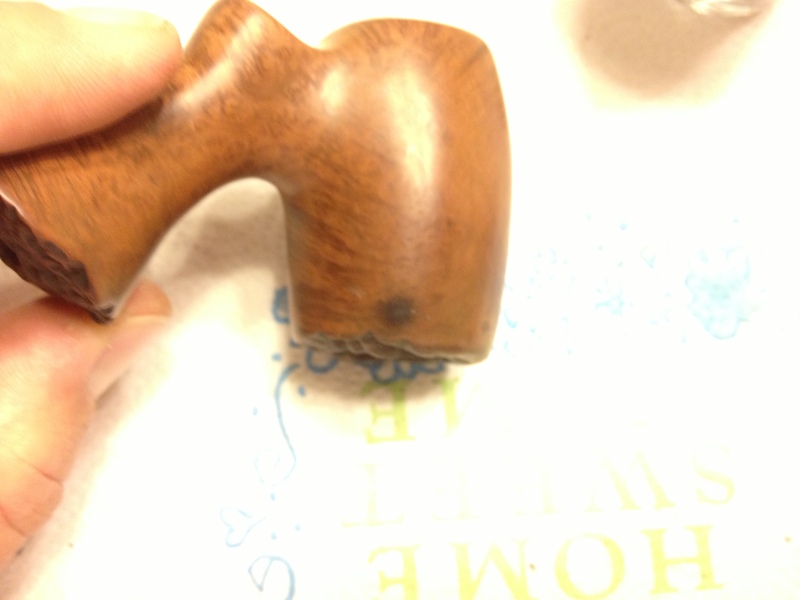 After the rubbing compound I took the stem to the heat gun to raise the dents. They came up pretty well but not completely. 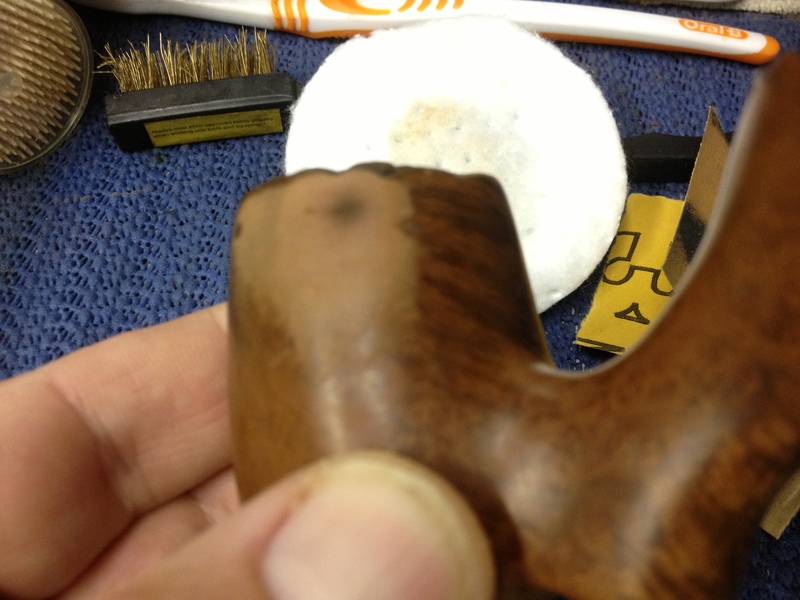 But they were now slight enough I decided to not sand them smooth; I wanted to finish this pipe and write this blog tonight, those things and the small dents left made this decision for me easy. 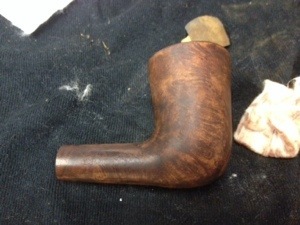 I did wet sand the stem with 400 grit wet/dry paper to remove the last of the oxidation and the few scratches I saw. 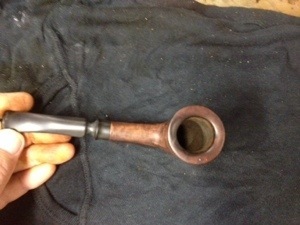 I reassembled the pipe and went to the buffing wheel. 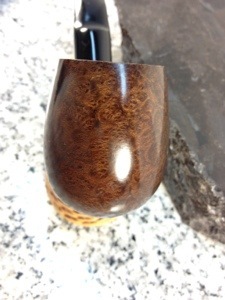 I like to buff the shank-stem union together so as to keep a nice fit. 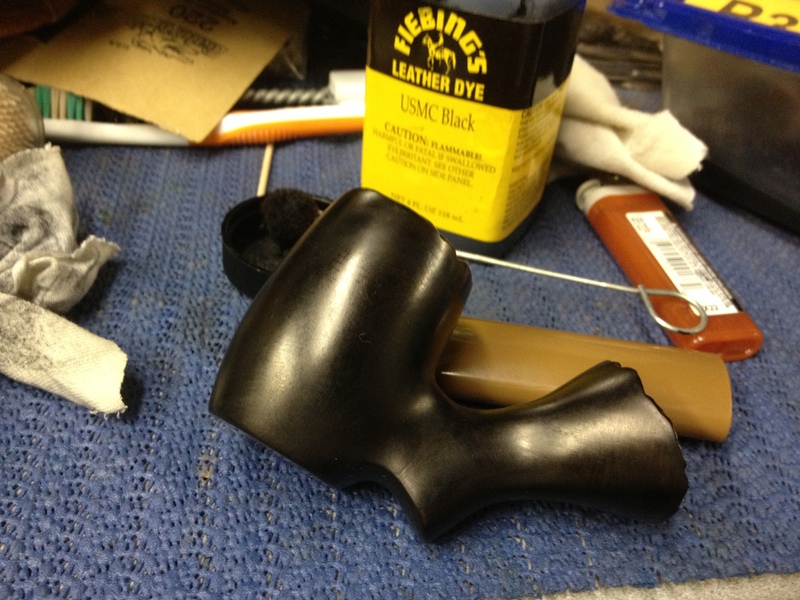 I began with black buffing compound, about an 800-grit I believe. 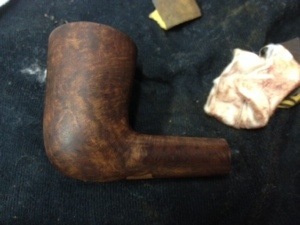 After the union was buffed I took the stem and stummel apart and buffed each piece. I moved onto brown tripoli, then white diamond doing the same process. I had a small deviation at the end of the white diamond buffing: the wheel grabbed the stummel and bounced it off my table. It left two dents, the bounce across the garage, that totally irritated me. I then had to steam the the dents out; thankfully the dents weren’t bad and came out. 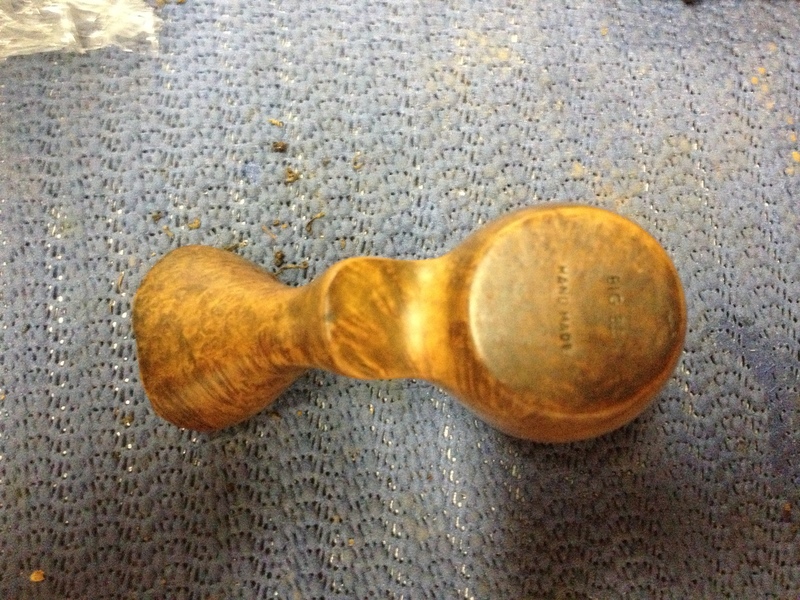 I went back to the white diamond and re-buffed the stummel. 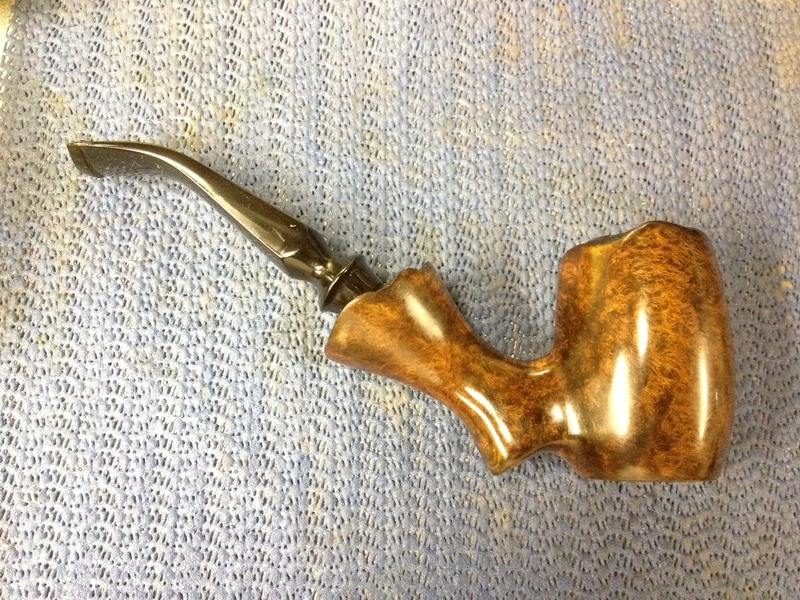 I reassembled the pipe and gave it several coats of carnauba wax, buffed it on a soft, clean wheel and, finally, hand buffed it wearing a pair of linen gloves I bought just for that purpose. 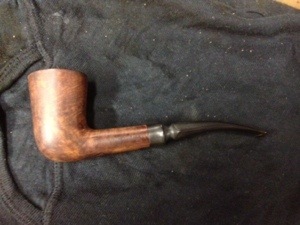 The pipe came out quite well I think. After cleaning and buffing it is a bit lighter on color, which I am very happy with; the grain, especially the Birdseye on the front of the bowl really pops now. 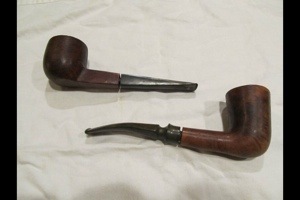 Hopefully the frantic pace of life will slow some over the coming weeks; I have many more wonderful old pipes that are patiently awaiting being brought back to life. And I am anxious to do the work an share it with you. 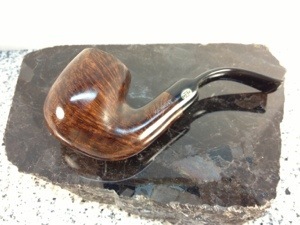 This entry was posted in Examples of Refurbished Pipes, Pipe Refurbishing Essays and tagged Bowl - finishing, Bowl - refinishing, buffing, GBD 9456, GBD Midnight pipes, GBD pipes, Greg Wolford, Oxidation, polishing, stem polishing, stem work, waxing on June 13, 2013 by Greg. 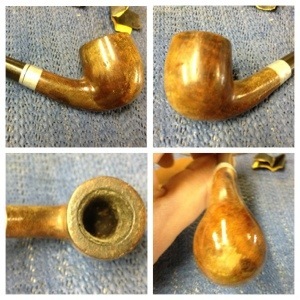 Not long ago I was involved in a discussion about what I do when I start restoring an estate pipe. The subject was on removing oxidation from stems so I stated that the first thing I do is an OxyClean bath, soaking for an hour to overnight. 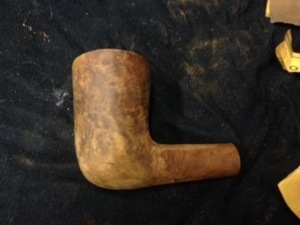 One of the folks involved thought I meant that I put stummel and all in the soak and asked what it did to the briar. I explained that I didn’t put the stummel in, only the stem. 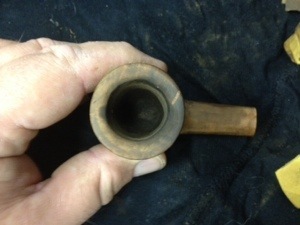 But this got me wondering what would happen if I put the whole pipe in … this this experiment. 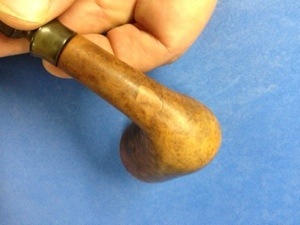 I picked this little pipe up in a lot and thought at first it was just a “toy” but closer inspection showed it had been used by its former owner – a lot. The cake was surprisingly thick and I figured it must have been his short smoke pipe. This unmarked little guy would be my Guinea pig. I dropped the separate pieces into the Oxy bath and left it overnight, doing no reaming, acetone wipe, or anything else before so. It sat overnight as the OxyClean did its work. 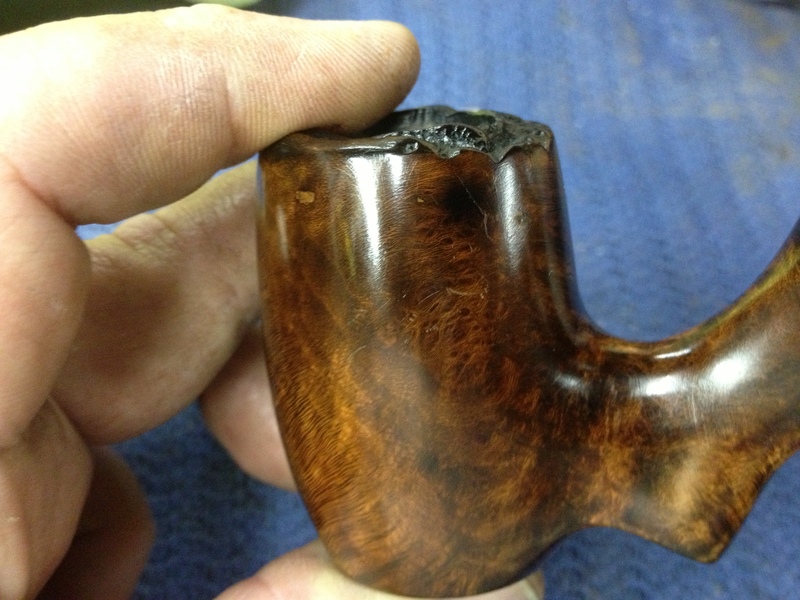 When I returned to it the next day I retrieved the stem first and saw the soak had done its job on bringing up the oxidation. 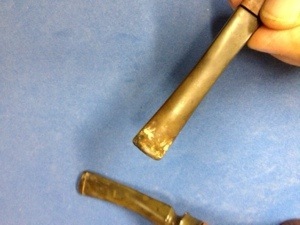 And I was a bit surprised how much oxidation there actually was. But onto more pressing issues: What did the briar look like? 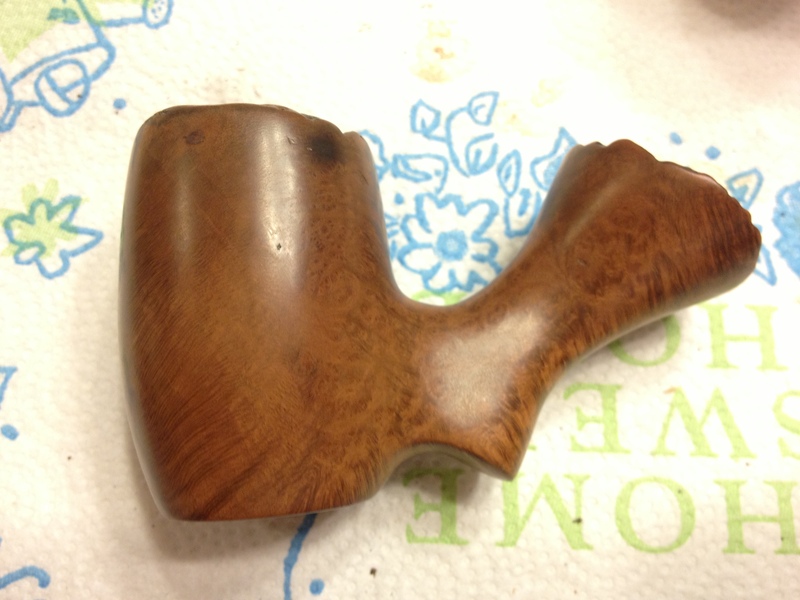 So I reached in and pulled out the stummel and immediately felt the slick, almost slimy feeling that an OxyClean soak gives stems was on the briar, too. 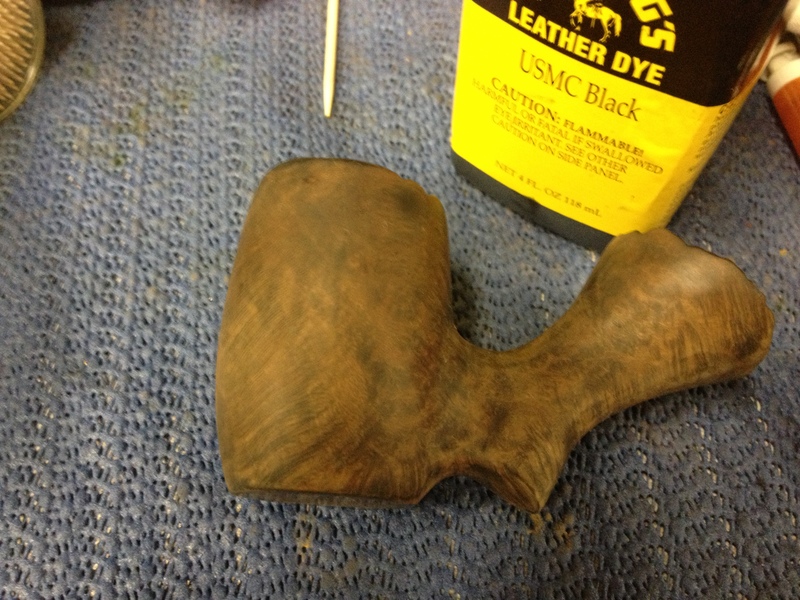 I began wiping it dry and noticed immediately that almost all the finish and a fair amount of the stain was gone. There was one patch that didn’t seem to be too effected by the soak, maybe it was not fully submersed; I don’t know. The next thing I noticed was the cake, or lack thereof. The OxyClean bath had removed pretty much all of the buildup in the bowl and on the rim, which wasn’t to bad to start with. It would most likely not need any reaming after it was dry from looking at it. So, what do I think about soaking the whole pipe in OxyClean now? I think that of removing the finish and stain are your goal and it has a fair or greater build up of cake/tars, this probably a pretty viable option. 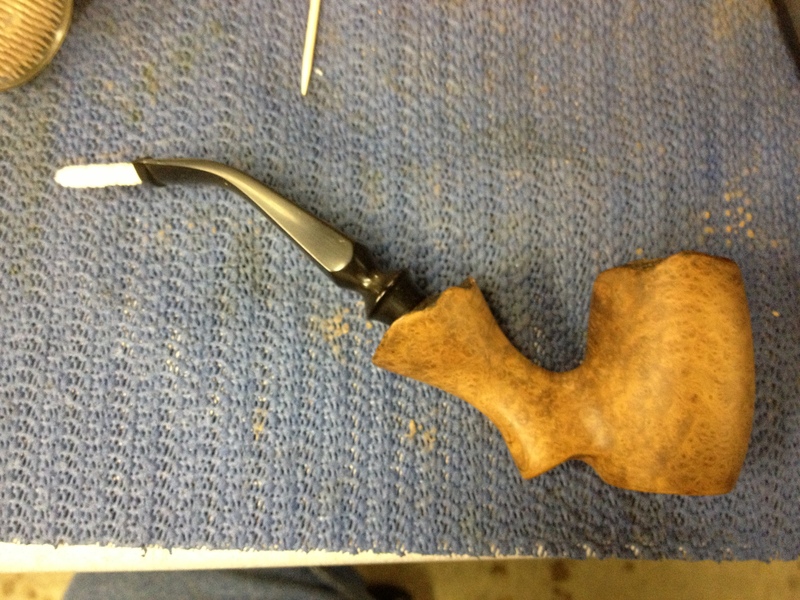 I still need to get the rest of the finish off and sand the stem and stummel; it is nowhere near finished. But I am leaning toward this experiment being called a success. Of course after the pipe has dried well and I finish the work on it I’ll have a better idea of what the pros and unknown at this time cons are so more experimentation is needed to say for sure. But at this stage I think I have new weapon to use (really an old one in a new way) for certain situations. Time will surely tell. 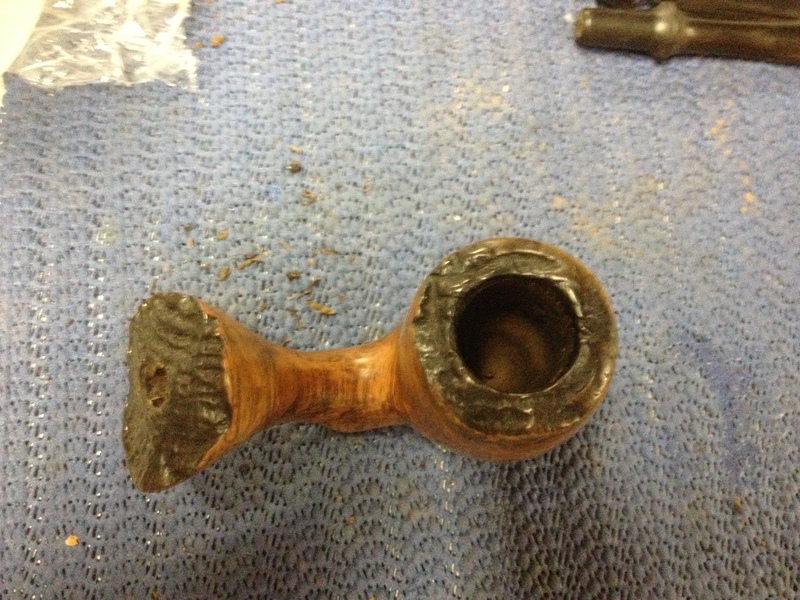 This entry was posted in Pipe Refurbishing Essays and tagged Bowl - finishing, Bowl - refinishing, finishing, Greg Wolford, Oxidation, Oxyclean, pipe refurbishing, polishing, refinishing, refurbish, restaining a bowl and rim on April 18, 2013 by Greg.